Oh T-Mobile you are such a tease. 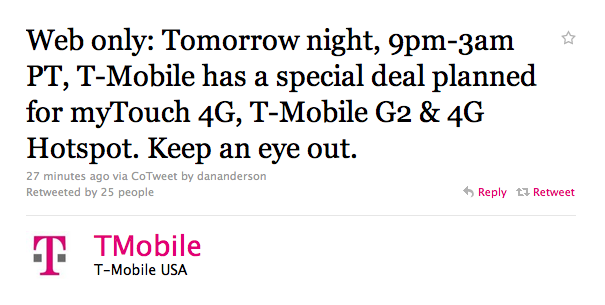 The official T-Mobile twitter account just sent out a teaser tweet promising a “Web Only” special tomorrow night from 9pm to 3am PST on the T-Mobile G2, myTouch 4G and 4G Mobile Hotspot. The last time T-Mobile ran a Web Only special on the myTouch 4G all colors were free so this is definitely something to look out for tomorrow night. Of course we’ll keep you in the know as soon as T-Mobile unveils the offer! ← T-Mobile Readying Microcell In Home Solution? wonder what kind of deal!!! hopefully it’s good – i haven’t had reason to buy a device in awhile…if it’s good and works for me, i’ll be there. lol they are trying to get rid of those phones. Samsung Galaxy S 4g, Lg G2x, and upcoming HTC sensation. As much as Love you, you make me cry for granting the phones I love as “free phones” a month before I get to make an upgrade. I thank you. Yours Truly, Dedicated T-mobile Subscriber. Call retentions and they’ll let you upgrade now if you’re that close to your upgrade date. Probably want be anything for upgrades. These promo are usually geared towards new customers. Actually, they did a similar deal a few days ago, but you missed reporting on it.